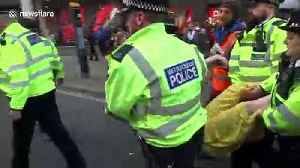 Climate protesters have climbed on top of a train in a busy financial district and glued themselves to the roof. 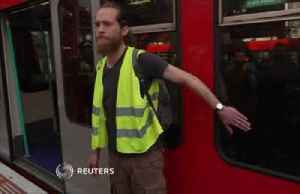 Two Extinction Rebellion demonstrators clambered aboard the carriage of a Docklands Light Railway (DLR) at Canary Wharf station in east London. 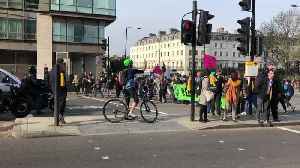 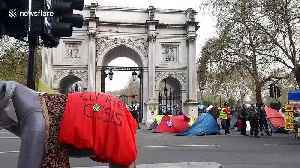 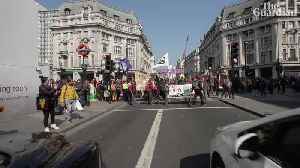 Climate change activists from Extinction Rebellion continue to block traffic in central London on the third day of protests. 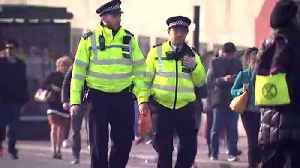 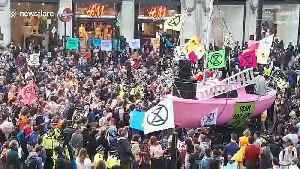 Footage shows a crowd of protesters gathering around a pink boat at..
Three Extinction Rebellion campaigners glued themselves to a train at London's Canary Wharf.